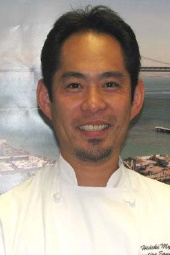 Hideki Myo has just been appointed as Executive Chef of Hyatt at Fisherman’s Wharf where he will oversee the recently renovated Knuckles at the Wharf, the new Enoteca Musto, all of the hotel’s banquet and catering needs and room service. Chef Myo brings an extensive culinary career of sixteen years to the hotel where he will incorporate his vast array of cooking techniques and culinary influence. Chef Myo joined the Hyatt family over eight years ago at the Hyatt Regency San Francisco. He worked his way through the ranks as Sous Chef, Banquet Sous Chef and eventually Executive Sous Chef. His culinary background also includes positions at the renowned Westin St. Francis in Union Square, San Francisco as well as the Westin Hotel in Tokyo, Japan. His cooking style is influenced by French and Asian techniques while incorporating fresh California, local organic and sustainable foods.